I don't think I made any posts on Korean food before because the only time I go to eat Korea would be at 3:00 am after the bar. So my friend was kind enough to take me to Norboo, she was Korean and took care of the ordering. 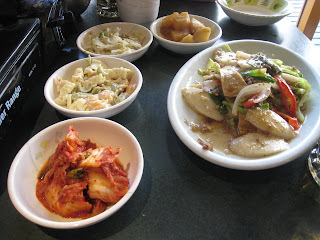 We had a mochi (rice gluten cake) in soy sauce, some type of korean popcorn shrimp and a bi bim bop hot pot. Everything was quite tasty. 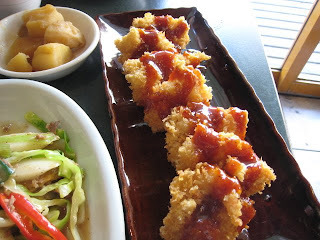 The popcorn shrimp didn't taste Korean, the batter was kinda "Katsu" ish but the shrimp kinda tasted Captain Highlander but I like that ghetto taste. 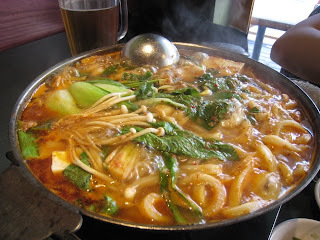 Hot pot was good, filled with udon noodles, mushrooms, mochi, tofu and other vegetables. I love all the free refillable sides you get with Korean food (potato, bean sprouts, kim chi, and macaroni. The hype part was I didn't smell like Korean food when I left, not to sure why. Note: There is another really good Korean spot named Insadong way out in Coquitlam that has amazing seafood hot pot, to be reviewed later when I go on that mission. Your friend "Was" Korean? she wasn't by the end of the meal?? hahahaha...Yo, that joint looks i'll, More times I remember passing it. 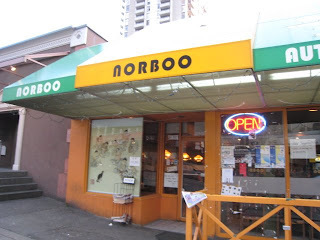 I`ve only been to two Korean joints...Jang Mo Jib on Robson and coincidentally I did go to Indasong. 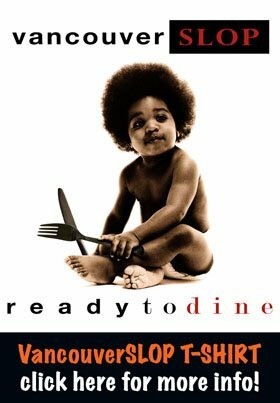 I`ll let you review Indasong though. try to use the culturally appropriate names of the foods you are eating. 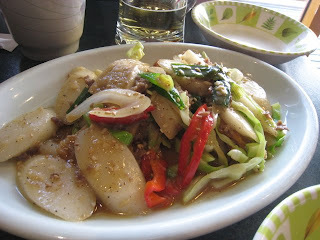 it comes across as ignorant and careless calling korean food by japanese names. defintely try Insadong! It's my fave place to go for Korean food, and I'm Korean! the "couple" BBQ combo for 2 can actually feed 3!